Duck Island sewing kit in printed box to match the Duck Island range of toiletries. 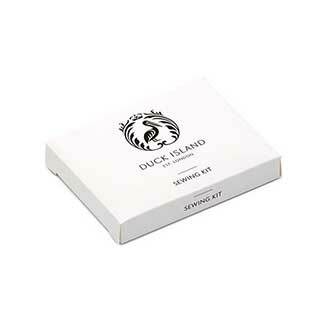 Sewing kit consists of various colours of thread, one needle, one small safety pin and two white buttons, presented in a white glossy box printed with the Duck Island logo in black. Quantity: 500 per Case. Duck Island products are not tested on animals and the formulations are examined and certified by an independent specialist laboratory to give peace of mind. Wherever practical everything is recyclable.